What’s good for the goose is good for the gander. The only real difference between fascists and Communists is that the former have a better wardrobe. I’ve spent a fair amount of time berating the regimes in Cuba and Venezuela, rampaging about human rights abuses, economic shenanigans and ridiculous rhetoric. It’s now time for the far-right to bend over and receive its licks. In 1976, the military forces of Argentina staged a coup against President Isabel Martinez de Peron, widow of controversial Argentine leader Juan Peron, citing ineffectual leadership in a grinding guerrilla war between left and right-wing paramilitary groups. 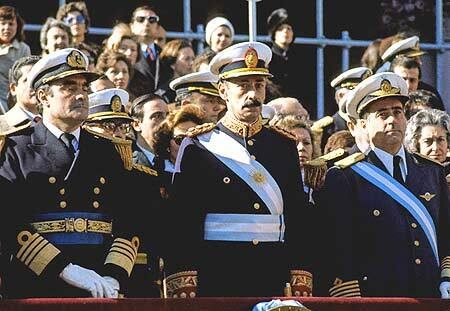 The subsequent military junta, ruling from 1976 to 1983, was among the most repressive in the history of the continent. Innocuously dubbed the National Reorganization Process, the junta promptly made Argentina a police state, suppressing all civil rights and suspending any semblance of due process. The military government continued the “Dirty War” against leftist Montonero guerrillas, a process that began under the previous administration. Yet despite the often-brutal tactics of the leftist rebels, it paled in comparison to the state-sponsored terror that would follow. One of the most heinous abuses of the regime was the abduction and relocation of the newborn children of imprisoned mothers. Under the flimsy excuse that “subversive parents will raise subversive children”, as many as 500 newborns were literally ripped from their mothers’ arms and forcily “adopted” by the families of high-ranking military officials. To this day, groups such as the Mothers of the Plaza de Mayo are fighting to identify the whereabouts of these children. It took a ridiculous war to finally stop the madness. Unrest and dissatisfaction was growing in 1981, as corruption and economic crisis weakened the regime. A new junta took over and used national fervor to attack the Falklands islands in the south Atlantic, a British possession with more sheep than people. The resulting Falklands War, the 1982 debacle that ended in a decisive British victory, accelerated the demise of the military government, and a new democratic constitution was ratified in 1985. The Argentine juntas, along with the Brazilian military government, the Chilean dictatorship of Augusto Pinochet and Paraguay’s Alfredo Stroessner, form a ring of right-wing dictatorships that terrorized their populations in the 1970s and 1980s. They worked together in a covert anti-Communist operation called Operation Condor, which received tacit approval from the US government. The Argentine atrocities spread across the Southern Cone of South America. These governments still generate controversy. Many conservatives, including myself at a certain point, argued that these governments, and their actions, were necessary to prevent the spread of Communist governments on the continent. Many contend that the economic status of these countries, especially Chile’s apparent success, are due in part to policies enacted during military rule. Sorry, but I don’t buy it anymore. A dictator is a dictator, no matter how good he/she makes you feel. No economic success, no ideological victory, no battlefield sacrifice can justify the wanton abuse of constitutional powers, the abridgement of human rights, and the outright slaughter of a country’s people. It doesn’ t matter that they’re Communist, socialist, conservative, liberal, fascist, Nazi, whatever. These guys were murderers, plain and simple. Below is a BBC documentary about the Argentine “Dirty War” of 1976-1983. It’s a rough subject, but a necessary one for students so they can appreciate the enormity–and fragility–of our freedom.